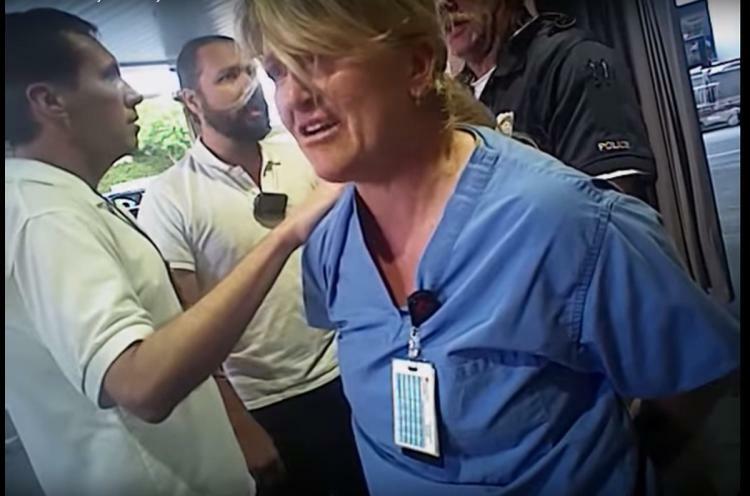 I woke up this morning to a disturbing and saddening video of Salt Lake City Nurse, Alex Wubbels, being dragged out of her hospital and into a police car. Why was this Utah nurse arrested? What did she do? Her job. In the below video, you can clearly see that Alex was politely explaining the hospital policy to the police officer. The police officer wanted a blood sample from the patient, and Alex explained to him that she could not do that because the patient was unconscious. According to that hospital’s policy, the police either needed a warrant, consent from the unconscious patient, or the patient needed to be under arrest before the blood sample could be drawn. “I’m just trying to do what I’m supposed to do,” Alex said. The officer then placed her under arrest and violently drug her out of the hospital. Please watch for yourself. As a nurse, would you like to know why we are truly so upset about this? People have NO IDEA how much violence nurses face on a daily basis. Violence towards health care workers has increased 110% in the last decade. One recent study of nurses found that 76 percent said they had experienced physical or verbal abuse from patients and visitors in the previous 12 months. About 30 percent said they had been physically assaulted. These statistics have been echoed from every nurse I know. A patient recently broke my 21 year-old sister’s nose while she was on shift. What did she do? She finished her shift. What did she do the next day? She went back to the hospital. She had patients that needed her. THIS IS WHAT NURSES DO. We sacrifice our own protection ALL the time to protect our patients. It is worth it. It’s in our very code of ethics. It makes us who we are. Nurses have been protecting and advocating for patients since the very inception of our profession, and we do it EXCELLENTLY. We vow to uphold and advocate for the rights of every patient, even when they are wrong, even when they hurt us, even when it is hard. But this violence? Violence from an officer who should be protecting that nurse? It is so wrong. And it’s deeply saddening. I’m sad for this nurse. She will probably never be quite the same. The Salt Lake Police Department needs to correct this wrongful action immediately. I am glad the mayor and the police chief issued an apology to her this morning. But in this sadness, I also want to say that it cannot be forgotten that nurses and police officers work together for patients ALL the time. Those statistics about violence towards nurses? They would be SO MUCH HIGHER without police officers. Police officers are present in every hospital across this nation, every day, working to protect nurses from violence. We have a bond as first responders, one that won’t be broken over this terrible case. I promise you that nurses will continue to be thankful that police officers endure violence every day to protect our patients as well. That’s part of why the bond of nurses, police officers, firefighters, and EMTs runs so deep. We get it. We take the violence, we care for the broken, and we do what needs to be done. In a world so eager for strife and division, this will not divide us. But please, stand up against violence towards nurses. We stand up for our patients every day.